The popular and eco-friendly way to get around town returns April 28 with improvements. The inaugural e-bike share ride in July 2017. Hiring a part-time staffer who will be available locally to provide information on the system to users. Upgrading and improving the user interface of the mobile application, website, and kiosk. Development of instructional videos for users (i.e. how to adjust the saddle and test the battery life). Plans are also in the works to build six new bike share stations, three within Park City Municipal boundaries and three stations within the Summit County jurisdiction. The city has already identified two future station locations, at Park City Municipal Athletic & Recreation Center and North City Park, and are actively in the process of refining the third location. "Initially we anticipated the funding would allow the construction of the stations in early spring in time for the reopening of the program," said Collins. "However, because the timeline of the funding is completely dependent on USDOT and UTA, we're unsure of the exact construction timeline though we're hopeful these improvements will move forward during the 2018 season." The grant funding may be applied to improvements surrounding the stations, which could include enhanced crosswalks, increased signage, curb cuts, additional multi-use pathway/bike lane improvements, etc. Between the the bike share's launch date on July 19 through November 3, when the bikes were retired for winter, Park City residents and visitors used the e-bikes to pedal more than 32,400 miles on over 9,500 trips. As a result of the system use, more than 1,400 gallons of fuel were displaced, preventing more than 25,900 pounds of CO2 from entering into the atmosphere. 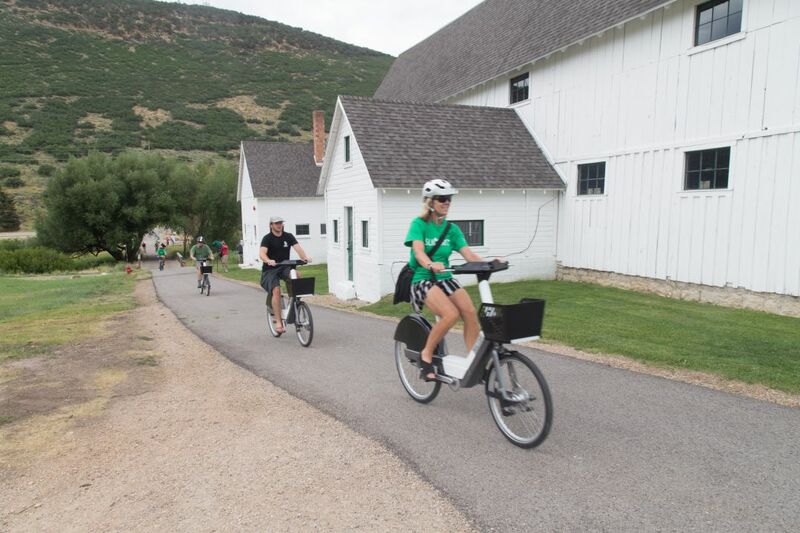 "The emissions avoided by the use of the e-bikes in just the first week of the program in July, is equivalent to greenhouse gas emissions from one car driven for half a year," said Julia Collins, Senior Transportation Planner for Park City. In addition to alleviating traffic and bolstering the town's environmental friendliness, the Summit Bike share program also provides recreational opportunities and easy connections to the bus route as the nine stations are in close proximity to transit, major destinations, and readily accessible by the urban pathway network. If you haven't taken a spin on the e-bikes yet, we encourage you to try them out this season. Single trips cost $2 or you can purchase weekly ($18), monthly ($30), or annual ($90) passes for unlimited trips. Check out the Summit Bike Share website to purchase your pass and stay up-to-date on the latest system improvements.